Linemaster Switch Corporation’s mission is to provide a superior foot switch at an affordable price without compromise. Linemaster's proven quality and custom design capabilities at affordable prices are the hallmark of growth and success. They respond to the changing needs of customers by taking significant advantage of exciting new technologies. They are able to design and test new foot switch products in merely a fraction of the time it took in the past. Linemaster has an experienced and knowledgeable staff at your service. They have an expert team of design engineers to see your specifications through to completion and can aid in the selection, recommendation, and specification of your product needs. Their customer service team is second to none and available to assist in your every need. A factory-direct outside sales force is ready to assist you in meeting your time critical application requirements. Linemaster is a company that exudes quality. At the heart and soul of the company is a dedication to produce the highest quality foot controls in the world. Since their inception, Linemaster has been the standard by which all other foot switches are judged. Their dedication to quality can be found from design to delivery. They have a quality control process that exceeds all relevant regulatory requirements. Linemaster offers more than 550 catalog models; more than any other foot switch manufacturer in the world. They offer a complete range of electric, air-powered, variable speed, and wireless foot switches. Turnkey and custom variations have become a specialty of Linemaster. 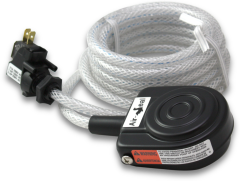 Linemaster was the first to market with an IR wireless foot switch that met the changing needs of their customers. Linemaster has since expanded to RF Wireless technology offering many more key features especially the extended battery life and unlimited RF channels.